This is my new truck. I admit it is a little rough around the edges, but remember, it is a fully functioning ¾ ton J-truck; a 1979 J20, to be exact. That means I have a Dana 60 rear, and a Dana 44 front. I have eight lug wheels, and plenty of room to work with. What have we done to the truck? Well, that is something you will have to go to the J20 Build blog for. This blog here is for the hot rod, and this is just my reasoning for procrastinating – one of them. Maybe you were unaware of this, but the J10 was not my first run in with a Full Size Jeep. My first full size was an ’84 Wagoneer. I bought it off a father/son that had lost interest. That was sometime in 2012, actually it was in August. You will find out shortly why I just remembered that. Anyhow, my Waggy was a basket case full of fun. Power everything, plush leather seats, carpet interior… except that the carpet interior was all rolled up and thrown in the back, and the plush leather seats needed re-upholstering. The power everything worked, and even though it got me nine miles to the gallon, I loved that ginormous grocery getter. It was a love that was to be short lived. Not but thirty days after I purchased the Wagoneer, did some broad rear end me on the freeway off ramp. She was doing 40mph, I was doing stopped. The good thing about being in that beastly vehicle is both Jaiden and I were unharmed. My truck on the other hand, was now nine inches shorter. She hit me so hard that the factory welds on the radiator broke, causing it to fly into the engine fan. Right there I had a salvage vehicle; I could not drive it off the site, so it had to be towed. Upon further inspection, I found cracks half way through my frame at the firewall. Seeing as someone else was at fault there, insurance took over the dealings with. I actually made money when I bought the truck back. I had it towed to a friend’s house where it stayed for about 18 months before I cannibalized it for the hot rod. I let him scrap the remains in order to compensate for my storage fees. I took the drive train and axles, and he took the rest to the scrap yard. It was that very Jeep that led me to know Tad, and then Jerry; I met Rick because of it too. Now that you know I have had two Full Size Jeeps totaled by women, and that my son Jaiden was involved in both of those accidents – you may be wondering why I would be so interested in getting another one, and why Jaiden would be so excited to help me build it. Well, again the answer is simple – they are just that effin’ cool! Back to the now, I continued my search for another J-truck and I had a specific set of guidelines to follow this time. Knowing these rules will also help make sense to why I did not mind talking two separate men out of selling their trucks. My perfect truck would have been a ’74-80 with a pre-’68 title, and since that gets into grey areas with the paper police, I was probably not going to find one of those in my price range. But otherwise, that was it, just three rules. And, when you actually got down to it, I really only needed to follow Rule #1. You see, back to Arizona emissions law, I can transplant any engine newer than the body year of the vehicle, and a ¾ ton is a valid recipient of a diesel transplant. Seeing as the J-truck ceased production in 1988 and Cummins did not start putting a diesel into a pickup until 1989, no matter what year ¾ ton truck I got, I was legal to swap. 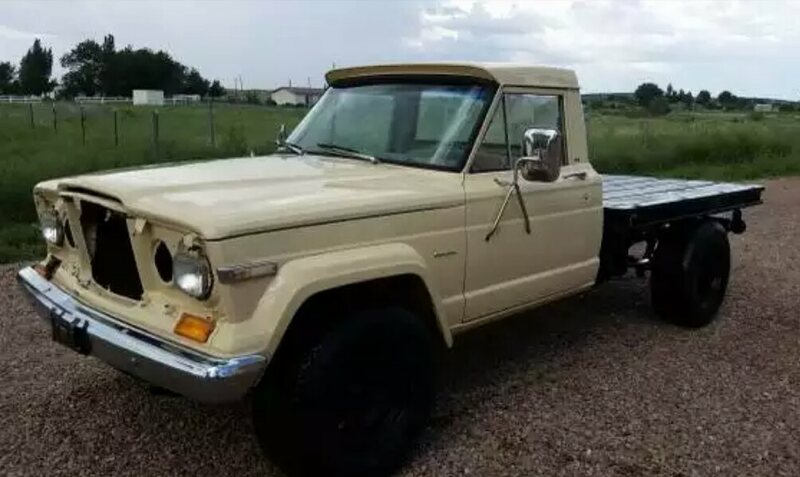 I almost gave up my search for a Jeep truck and actually started looking for Chevys and diesel Rams. I went to look at a few, even test drove some, but nothing was really what I needed. That was because I needed a Jeep truck. I nearly gave up on the truck search all together, when I came across an ad on the Craigslist. I checked it out. It was a flatbed, which is not something that I was for or against; it was not even a consideration of mine. I asked Adam when the latest/earliest that I could come to see the truck and he told me that he got home at 18:00, and that any time between 04-06:00 was fine to look at it. I told him that I would be there around 05:00 the following day to come check it out. He obliged and so it was set up that I would meet him the following morning to look at his truck. I asked him the normal questions, and it all seemed legit. I test drove it, and it drove better than my J10 did, as there was no road shimmy above 55 mph. The manual transmission shifted fine through all of the gears, and the brakes worked like they were supposed to. So, I was looking at a truck that started, stopped and steered like it was supposed to, let’s see what I can get this for. I asked Adam what his bottom dollar was. He replied by telling me there was a buyer from New Mexico that was going to buy it, sight unseen, for asking price. $2800 it is! We made arrangements to get it to my house, and it so happened that he was going to my side of town the same day I was to come home, September 11. He trailered it to my house and I met him with cash in hand.